Russia has countered the Obama administrations attempt to interfere, once again, in the Ukraine. The US decided to move guided-missile destroyer USS Truxtun into the Black Sea, and Russia has made their next move by deploying a Bastion anti-ship missile system in Sevastopol, according to Joseph Watson at InfoWars. “The system is designed for the destruction of various surface ships from an enemy’s landing squadrons, convoys, carrier strike groups, as well as single vessels and land-based radiocontrast targets in conditions of intensive fire and electronic countermeasures. The system uses the P-800 Yakhont (SS-N-26) anti-ship cruise missile and has a maximum range of 300 km,” states a separate report on a Vietnamese military website. Tensions are high and with the buildup of military force and world leaders with nuclear weapons, pound their chests and counter move after move, threats issued and battle lines being drawn, one wrong move, one over-the-top insult or sanction or even an accident could be construed as a declaration of war and BOOM, world war III begins. 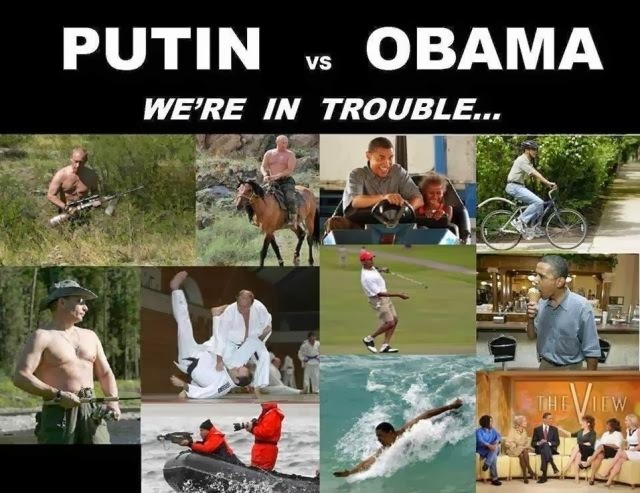 Yes, that is what happens when you pit a community organizer (Obama) against a KGB war expert (Putin).